From a Pacific Crest press release: Pacific Crest is proud to announce its new visual design team for 2007. Joining the corps for his first season will be drill designer Jeff Fackler. 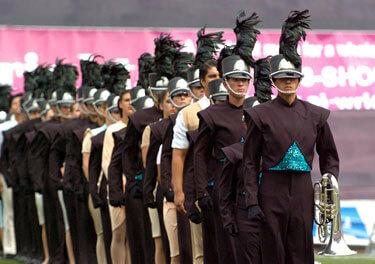 Fackler has consulted and designed for more than 200 bands and drum corps nationwide. He is an active visual clinician and adjudicator throughout the United States and is the staff designer for the University Of Oregon Marching Band. Pacific Crest at the 2006 DCI World Championships in Madison, Wis.
"Fackler is one of the most outstanding young designers working in the activity today and we think that he will bring to Pacific Crest a demanding, fresh and exciting look that will satisfy both our members and our fans," said Pacific Crest Executive Director Stuart Pompel. Pacific Crest also has named a new visual coordinator, Jeff Sterrett, and will call on DCI Hall of Fame member Michael Cesario as a consultant. Read more about these staff appointments on www.pacific-crest.org.